Bittame, A., Lopez, J., Effantin, G., Blanchard, N., Cesbron-Delauw, M., Gagnon, J. and Mercier, C. (2016). Lipid Extraction from HeLa Cells, Quantification of Lipids, Formation of Large Unilamellar Vesicles (LUVs) by Extrusion and in vitro Protein-lipid Binding Assays, Analysis of the Incubation Product by Transmission Electron Microscopy (TEM) and by Flotation across a Discontinuous Sucrose Gradient. Bio-protocol 6(20): e1963. DOI: 10.21769/BioProtoc.1963. Dissecting the interactions established between proteins and membranes in a given type of cells is not an easy task. Using a cell-free system of large unilamellar vesicles (LUVs) to analyze these interactions may help decipher these interactions and identify potential membrane deformations induced by the proteins incubated with these LUVs. This article describes the protocols for 1) extraction of total lipids from eukaryotic cells using the method developed by Bligh and Dyer (1959), 2) the quantification of glycerophospholipids by gas chromatography after methanolysis, followed by 3) the formation of LUVs by extrusion, 4) protein-lipid binding assay, 5) analysis of the incubation product by transmission electron microscopy (TEM) and by flotation across a discontinuous sucrose gradient and finally, 6) analysis of the proteins by immunoblot and revelation of the glycerophospholipids by iodin fumigation. Cell-free systems consisting in giant unilamellar vesicles (GUVs; vesicles composed of a single bilayer of phospholipids and with a diameter greater than 1 μm) or liposomes incubated with recombinant proteins may help understand these interactions. Depending on their diameter and number of lamellae, liposomes are classified into small unilamellar vesicles (SUVs; vesicles constituted of a single bilayer of phospholipids and with a diameter comprised between 20 and 100 nm), large unilamellar vesicles (LUVs; vesicles constituted of a single bilayer of phospholipids and with a diameter comprised between 100 and 400 nm), large multilamellar vesicles (MLVs; vesicles constituted of multiple phospholipid bilayers and with a diameter comprised between 200 nm and 3 μm) and multivesicular vesicles (MVVs; large vesicles composed of a single bilayer of phospholipids and containing several smaller vesicles, each composed of a single bilayer of phospholipids). When a dried mix of lipids is dispersed in an aqueous solvent, large multilamellar vesicles (LMVs) form spontaneously. Smaller liposomes (SUVs or LUVs) may then be formed by sonication or extrusion. Here we report the formation of LUVs by extrusion of LMVs formed from complex lipids extracted from HeLa cells and their use to investigate Toxoplasma proteins/membrane interactions by flotation across a sucrose gradient and by TEM. Note: The diameter of their pores is defined by the manipulator (Example: 100 nm, Avanti Polar Lipids, catalog number: 610005 ). Plate 20 flasks of 150 cm2 with HeLa cells in complete DMEM medium and incubate them for 3 days at 37 °C, in presence of CO2 (up to 100% confluency). Rinse the monolayers with 20 ml of DPBS. Scrape the HeLa cells in DPBS and pool them in 50 ml DPBS in a 50 ml glass tube (PYREX® disposable glass conical centrifuge tubes without cap). Centrifuge the cells for 10 min, at 4 °C, 350 x g and get rid of the supernatant. In the fume hood, resuspend the cell pellet in 3 ml of chloroform/methanol (1:2) at room temperature. In the fume hood, vortex the cell lysate every 5 min for 30 min to solubilize the lipids (room temperature). In the fume hood, add 500 μl of chloroform and 900 μl of H2O, vortex. Centrifuge for 10 min at 1,300 x g, room temperature. 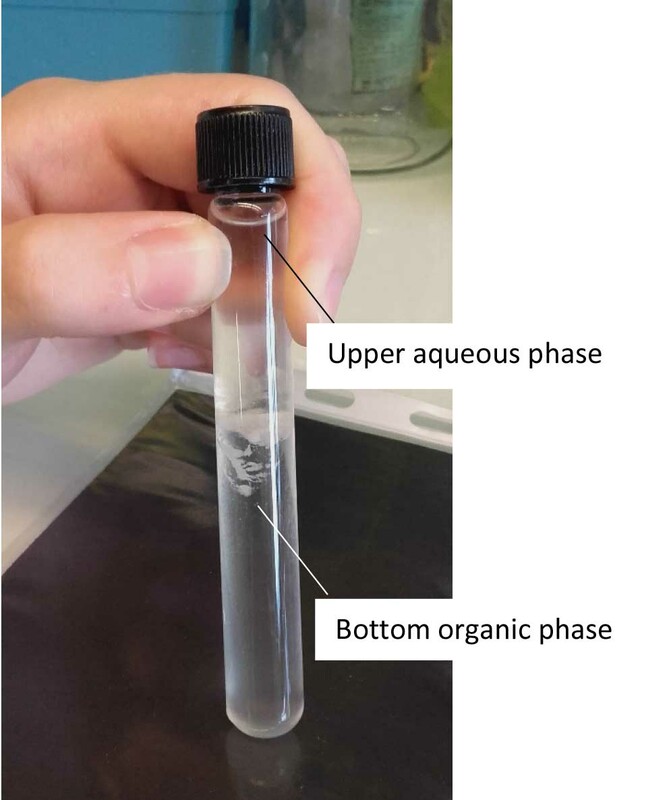 In the fume hood, transfer the bottom organic phase into a new glass tube tube (Disposable screw thread culture tubes with marking spot, ø13 mm) (Figure 1). In the fume hood, repeat the extraction with 500 μl of chloroform and 900 μl of H2O (steps A7-A9) to increase the lipid purity. In the fume hood, aliquot the bottom organic phase (1.5 ml per tube) into 5 ml glass tubes (disposable screw thread culture tubes). In the fume hood, evaporate the solvents under an N2 flux (0.5 to 1 psi). Note: This evaporation step also eliminates O2 molecules, which would oxidize the fatty acids of phospholipids. Keep the dried lipid films (~200 μg/tube) at -20 °C until being used. Note: Quantification of the glycerophospholipids is performed by gas chromatography after methanolysis (see next section). To separate the fatty acids from the glycerol backbones and methylate them, a lipid film (such as the ones obtained at the end of section A) is resuspended in 3 ml of 2.5% H2SO4 (in methanol). Resuspend by pipetting several times. This step must be performed under a fume hood. Add a specific fatty acid as internal standard dispersed in methanol, for example 1 nmol (this should represent a small volume: usually 1 or 2 μl) of C21:0. Seal the tube hermetically with a Teflon cap. The methylation of fatty acids is performed for 1 h at 100 °C in an oven. When the tube has cooled down (at room temperature: this takes just a few minutes), stop the reaction by adding 3 ml of H2O and mix by pipetting several times (in the fume hood). Phases are formed by the addition of 3 ml of hexane: mix by vortexing, centrifuge for 10 min at 1,300 x g, room temperature, and using a Pasteur pipette, transfer the upper phase containing the methylated fatty acids into a glass tube (disposable screw thread culture tube). This step must be performed under the fume hood. Repeat the hexane extraction on the aqueous bottom phase (step B6) and pool the second upper organic phase with the first one. This step must be performed under the fume hood. Dry the pooled hexane phases that contain the fatty acid methyl esters under a stream of N2 (0.5-1 psi). This step must be performed under the fume hood. The lipid film is resuspended in 10 μl hexane (in the fume hood), injected into a BPX70 gas chromatography column (SGE) and analyzed by gas chromatography using a flame ionization detector (Perkin Elmer). The used temperature program is 1) 7 min 30 sec at 130 °C, followed by 2) an increasing ramp of temperatures from 130 °C to 180 °C, with an increase of 3 °C per minute, and finally 10 min at 180 °C. The fatty acids are separated by the N2 mobile phase (3.5 ml/min) according to their size and solubility. They are quantified by comparison of their retention time with that of the C21:0 internal standard fatty acid that was added during the methanolysis step. Note: A 150 cm2 flask of confluent HeLa cells yields ~400-420 μg of glycerophospholipids. Rehydrate a lipid film overnight at room temperature in 10 mM HEPES-150 mM NaCl (pH 7.4). Note: The lipids naturally organize themselves into MLVs of various diameters. Thawed in a 37 °C water bath. Note: The steps C2a-C2c, which are repeated 3 times, begin the separation of the lipid layers. Passed through an extruder: forcing 20 times the passage of MLVs through the calibrated pores of a polycarbonate membrane maintained between two Hamilton syringes separates the lipid bilayers one from another and allows the formation of LUVs. The photo of a mini-extruder equipped with two Hamilton syringes can be seen on the following website: https://avantilipids.com/divisions/equipment/mini-extruder-extrusion-technique/. Note: The LUV solution must be kept at 4 °C and be used for experiments within 2 days. 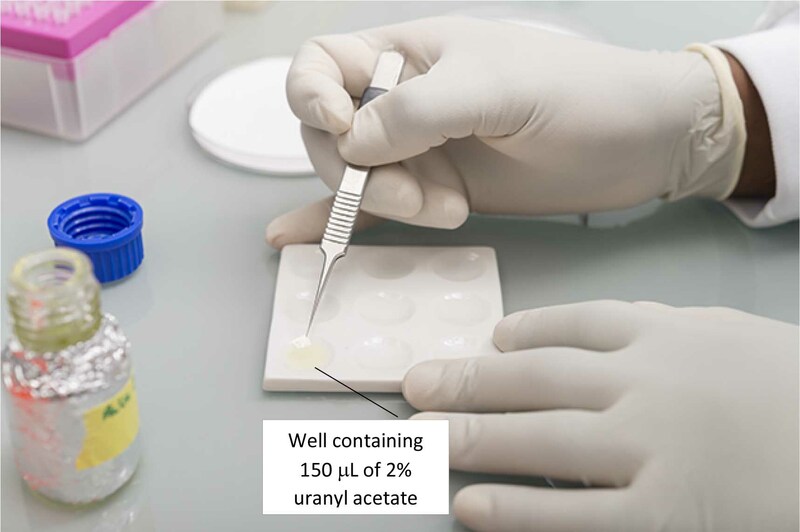 The binding assay is performed at room temperature for 30 min, under mild agitation (rotating agitator): 6 μg of purified (recombinant) protein are incubated with LUVs formed from 150 μg of extracted lipids and extruded at 100 nm. A carbon rod (3.05 mm diameter) is carved with a pencil sharpener. The carbon rod is placed between the two electrodes of the carbon evaporator and the mica sheet is positioned at the center of the evaporator chamber. Once the vacuum in the chamber is reached, carbon is evaporated for 400 msec. 2 μl of the incubation product is adsorbed on the clean side of a carbon film that had been pre-evaporated on a mica sheet. The carbon film is detached from the mica by floating it in a ceramic well (maximum volume: 200 μl) containing 100 to 150 μl of the negative stain solution (2% uranyl acetate solution) (Figure 2). 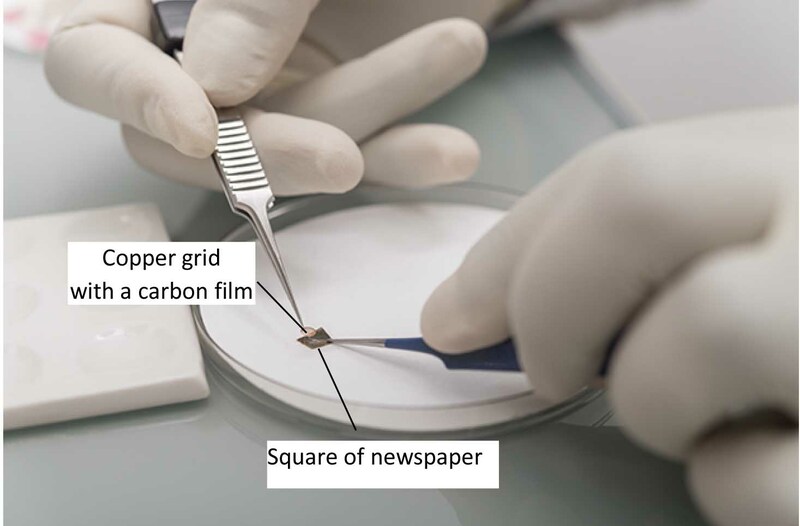 The carbon film is picked up onto a 400 mesh copper grid using a small square of newspaper (Figure 3) and air dried. The grids are observed using a transmission electron microscope (TEM) such as a JEOL-1400 Plus (MET 120 kV) operating at 100 kV. Images are recorded at the nominal magnifications of 10,000x or 40,000x (see the section ‘Representative data’). The protein-lipid incubation product is mixed with 160 μl of a 40% sucrose solution and deposited at the bottom of a 750 μl open tube. Using a P200 micropipette, the bottom fraction is covered stepwise by 110 μl fractions of each of the following sucrose solutions: 30%, 20%, 10%, 5%, 0%. Note: The sucrose solutions are prepared in the binding buffer. The gradient is ultracentrifuged for 16 h, at 100,000 x g, 4 °C in a MLS-50 Swinging-Bucket rotor using a TL100 ultracentrifuge. The photo of a discontinuous sucrose gradient (although used for other purposes) can be observed on the Bio-Protocol ‘Isolation of Growth Cones from Mouse Brain’ (http://www.bio-protocol.org/e853, Figure 2, left image). 25 μl of each sucrose fraction (or 40 μl of the bottom sucrose fraction) are mixed with 5 μl of loading dye solution and loaded into an SDS-PAGE (percentage of polyacrylamide to be adjusted to the molecular weight of the studied protein, typically a 12% gel allows the resolution of proteins in the range of 15-250 kDa) (see http://www.bio-rad.com/webroot/web/pdf/lsr/literature/Bulletin_6040.pdf and BioProtocol [Bio101] Laemmli-SDS-PAGE). The proteins separated by SDS-PAGE are transferred onto a nitrocellulose membrane and further revealed using a specific antibody (standard immunoblot technique revealed by chemiluminescence [ECL]) (Figure 4A, lower panel). 5 μl of each sucrose fraction are spotted onto a Thin Layer Chromatography plate: use a pencil to draw a line and separate the spots one from each other by 1 cm on the line. The plate is introduced into a tank (a photo of such a tank can be seen on the website) saturated in iodin fumes (iodin crystals introduced into the tank 30 min before the introduction of the plate into the tank): iodin binds to the double bounds of fatty acids and thus allows to reveal the glycerophospholipids present in each fraction (Figure 4A, upper panel). Figure 4. Illustrations of two techniques commonly used to analyze the incubation product of liposomes and proteins. A. Analysis of the incubation product of the protein rGRA2 with HeLa LUV extruded at 100 nm. The protein was incubated with HeLa LUV at a lipid:protein ratio of 25:1. The binding mixture was mixed with 80% sucrose, loaded at the bottom of a tube, overlaid with a step sucrose gradient 40%-0% (bottom to top), and ultracentrifuged. Five microliters of each fraction were spotted onto nitrocellulose, and unsaturated phospholipids were revealed by fumigation with iodine (upper panel). An equal volume of each fraction was analyzed by western blot (WB) probed with anti-GRA2 mAb (lower panel). 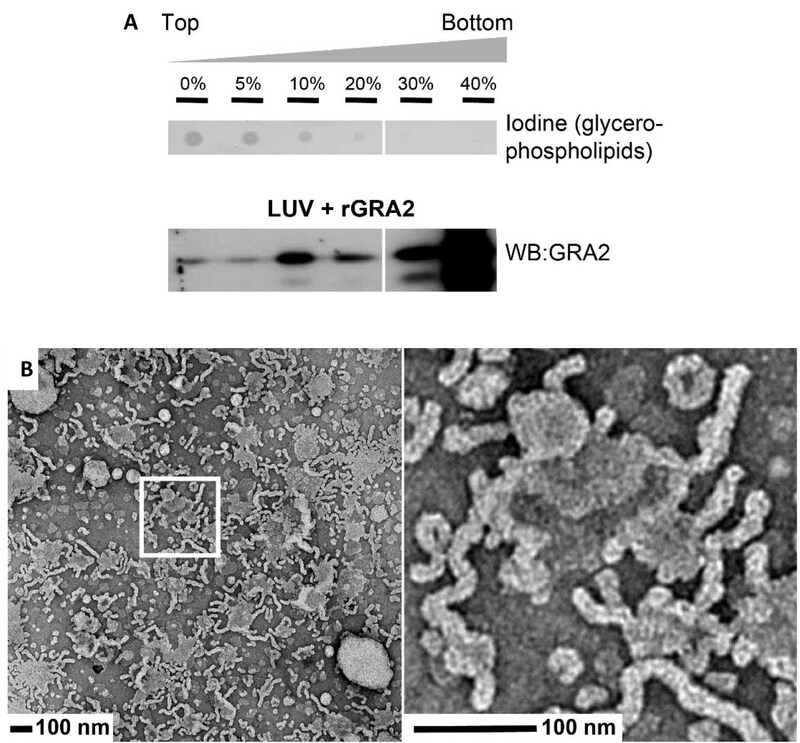 B. TEM analysis of the co-incubation of the proteins rGRA2 and rGRA6 with HeLa LUV extruded at 100 nm (lipid:protein, 50:1; rGRA2:rGRA6, 10:1). The right image represents a magnified view of the area in the white box. These figures are from the Figure 2 from Lopez et al. (2015). The results depend on the composition of lipids of the LUVs and the nature of the protein incubated with them. The binding experiment as well as the flotation experiment/immunoblot analysis and the TEM observations should be repeated three times with similar results to guarantee the reproducibility of the results. The results are mainly qualitative. The relative amount of protein bound to LUV membranes and which thus floats up to the top fractions of the sucrose gradient might be quantified using the phosphorimager technology or by quantification of the signal pixels of the scanned ECL films using the ImageJ program (free software for Image Processing and Analysis in Java; https://imagej.nih.gov/ij/). The procedure used is the ‘Gel Analyzer’ method found as a submenu of the ‘Analyze’ menu (Tutorials and Examples: https://imagej.nih.gov/ij/docs/examples/index.html). Examples of such quantification can be found in Lopez et al. (2015). This protocol was adapted from: Lopez et al. (2015). This work was supported by a grant from Cluster 10 to Infectious Diseases- Rhône-Alpes region (C. Mercier); a PhD fellowship from the Rhône- Alpes region (A.B.). The authors thank Dr Eric Maréchal for the quantification of the extracted glycerophospholipids by gaz chromatography after methanolysis; Dr Pauline Ruffiot for the initial experiments of LUV formation, the former Master students Anne Valat, Khadi Sall, François Hermetet and Vincent Grassot for their participation to the project. No conflict or competing interest. Bligh, E. G. and Dyer, W. J. (1959). A rapid method of total lipid extraction and purification. Can J Biochem Physiol 37(8): 911-917. Lopez, J., Bittame, A., Massera, C., Vasseur, V., Effantin, G., Valat, A., Buaillon, C., Allart, S., Fox, B. A., Rommereim, L. M., Bzik, D. J., Schoehn, G., Weissenhorn, W., Dubremetz, J. F., Gagnon, J., Mercier, C., Cesbron-Delauw, M. F. and Blanchard, N. (2015). Intravacuolar membranes regulate CD8 T cell recognition of membrane-bound Toxoplasma gondii protective antigen. 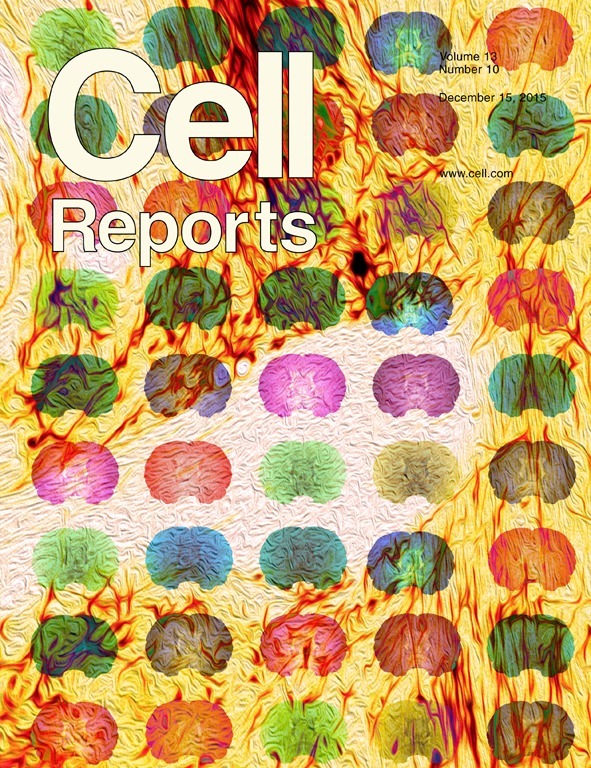 Cell Rep 13(10): 2273-2286. How to cite: Bittame, A., Lopez, J., Effantin, G., Blanchard, N., Cesbron-Delauw, M., Gagnon, J. and Mercier, C. (2016). Lipid Extraction from HeLa Cells, Quantification of Lipids, Formation of Large Unilamellar Vesicles (LUVs) by Extrusion and in vitro Protein-lipid Binding Assays, Analysis of the Incubation Product by Transmission Electron Microscopy (TEM) and by Flotation across a Discontinuous Sucrose Gradient. Bio-protocol 6(20): e1963. DOI: 10.21769/BioProtoc.1963.